Tired of getting Groupons for things you’ll never use? Endless offers for things you don’t want? – Get deals targeted to what you’ve always wanted to do! 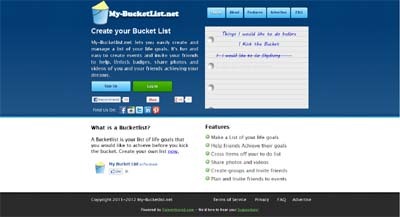 My Bucketlist – You can create your own list of life goals and invite your friends to participate via email or Facebook. Unlock achievements and share photos and videos when you check items off your list. Get group coupons and special offers for the things you always dreamed of doing! Facebook integration, coupons and offers.